As I approached what I thought to be a well pacified LZ, I was startled to see tracers coming at me from the starboard side of the chopper. In moments my door gunner lit up the sky with counter-fire. With a full load of troops in the back, the chopper was too low and slow, and we were far too heavy, to make an expeditious escape into the surrounding mountains; like it or not, I was going to have to drop these guys into a hot LZ. I was able to offload enough guys to secure the camp, but that was the limit of my contribution to the cause as I climbed out to the east, eyeing the protective hills with a combination of hope and dread. Dread won the day as my H-34 blew up in a spectacular fireball. There were no survivors. Fortunately, I had also dropped off two 2-man mortar teams and I no longer needed the heavy lift transport helicopter to support our mission; the Bell OH-13S scout chopper could carry a mortar spotter that I could use to destroy the enemy troops that had only seconds ago served up a heaping helping of ignominious defeat, and I could do so from a safe distance away. That’s critically import in a small two-seater like the Sioux as it has absolutely no armor to protect the pilot and observer. Actually, it’s worse that that. The cockpit of Sioux looks like one of those little glass jars they used to put goldfish in to be won as a prize at the county fair. Easy pickings, as it were. “And where did all of this happen?”, you ask. Well, it all started with the release of World of Warplanes 2.0. Having tried earlier versions of that online multiplayer shootfest, and not particularly liking it, I wondered if the promised upgrades in version 2 were enough to change my mind. They were not. 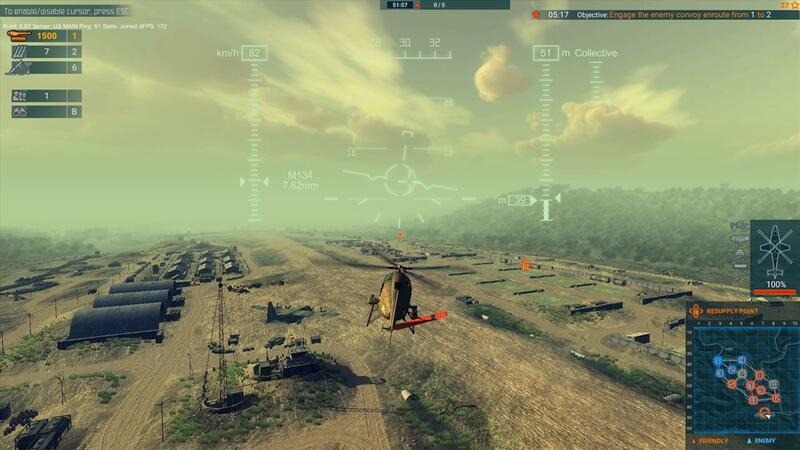 But… while perusing suggested alternatives I came across a recently released game called Heliborne. Developed by a small four member team that goes by JetCat Games, I didn’t have high hopes. That said, if there is anything I want to play, it’s a helicopter game. 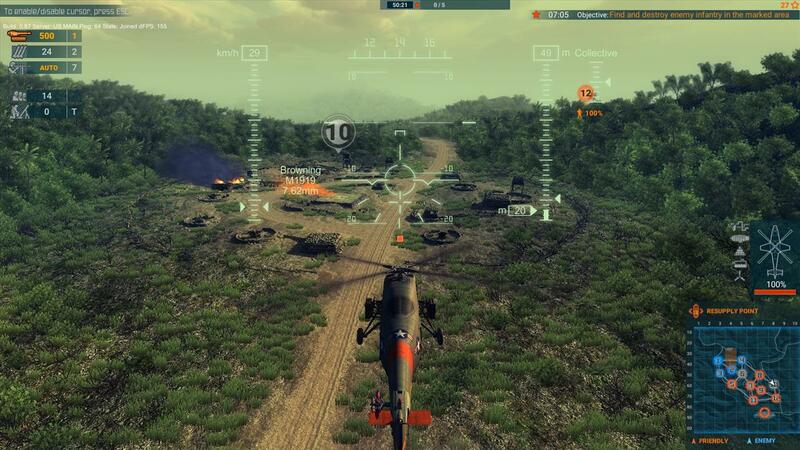 Heliborne looked like it might be a good one to try. The screenshots gave me a taste of what the battlefield would look like and it was impressive indeed. If you’ve seen a ‘Nam movie, say Apocalypse Now, for example, you already have a pretty good idea what this game looks like, at least in the early stages. That alone was enough to get me to part with a double sawbuck. I was not disappointed. 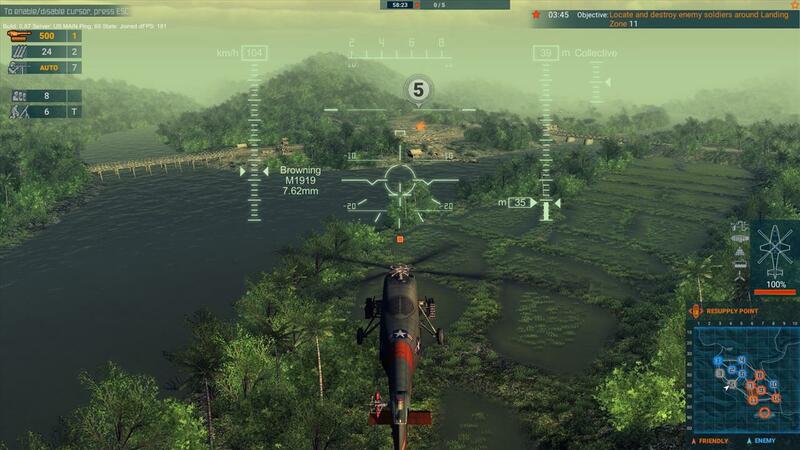 I will make this bold proclamation, then defend it: Heliborne is not World of Helicopters. It is better. Far, far better. There are, of course, many similarities between the two. First, and most obvious, it is an online multiplayer combat game. You start at level 1 and up-level as you gain experience. 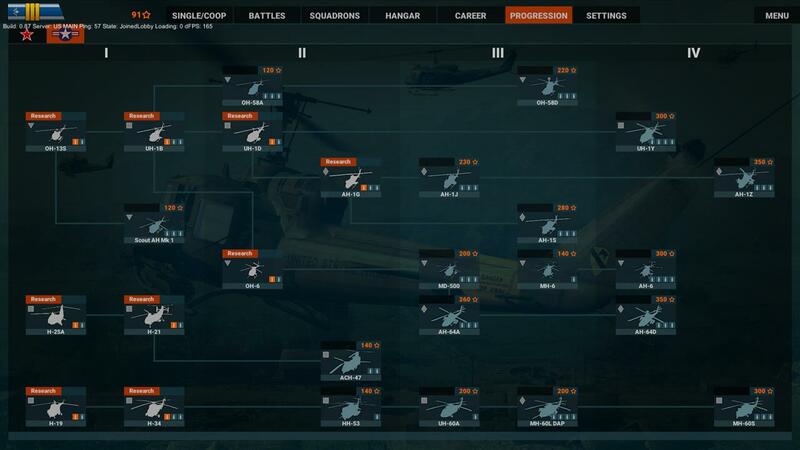 You use the points earned in battle to work your way through an expansive tech tree. As you gain access to more capable equipment, you also gain access to more capable opponents. 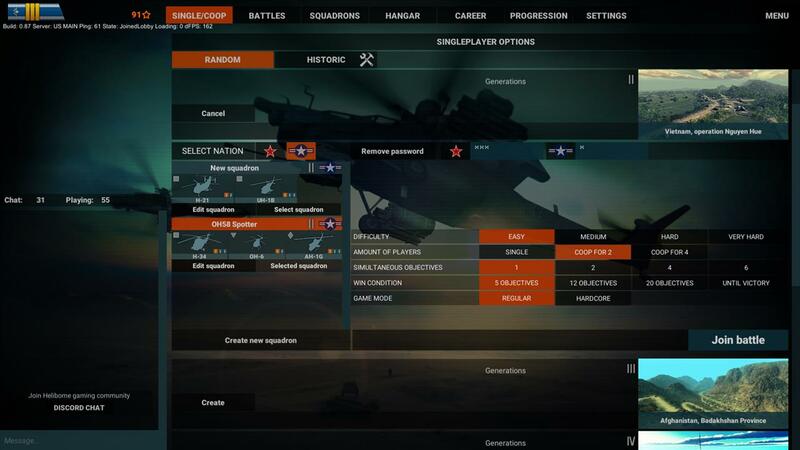 It is what Heliborne adds to the basic model that distinguishes it from the competition. 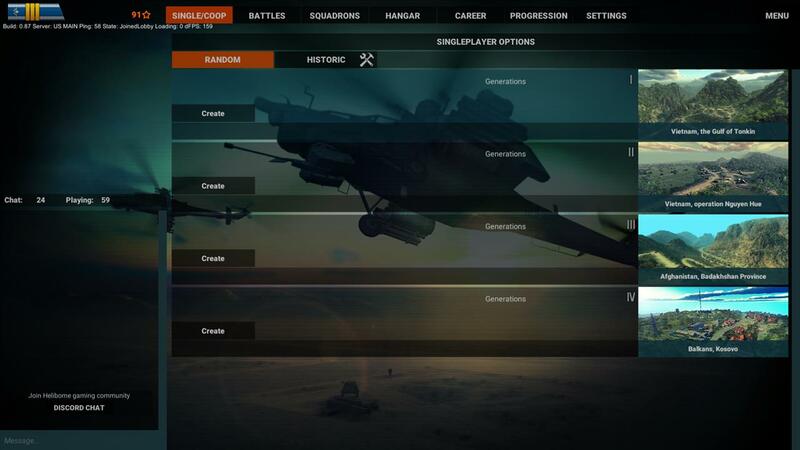 There are a number of ways to play Heliborne. The most traditional is player-vs-player wherein two teams go at it both in the air and on the ground in a game of Conquest, the goal of which is to capture and hold the preponderance of bases. The ground battle, for the most part, is handled by your AI troops. Your contribution comes from raining destruction and hellacious violence from the air. It is this aspect that brings forward the difference between warplanes and helicopters as fighting machines: air power cannot win wars. Ground troops without air cover cannot win wars. Helicopters, being the best of both words, can win wars. To understand this, you have to refer back to the caveat “for the most part” in the prior paragraph. While the AI is going to manage the behavior of your individual troops, it is you that decides where those troops are going to be. When you load out a transport chopper, you decide the mix of infantry types to load. Basic infantry serve to occupy and defend a loading zone (LZ) by manning antiaircraft guns, firing nests, and the like. You can also carry mortar teams, troops carrying portable anti-aircraft missiles (MANPADS), and troops carrying rocket-propelled grenades (RPGs). The latter specialists can be dropped anywhere on the map, while occupying troops can only be dispersed on LZs. Once dropped, all but the mortar teams behave autonomously. You play as the orange team and your opposition plays as the blue team. At the start of a battle, you will each have one base (at least in level 1 and 2 - I enjoy the older piston helicopters so much that I have not yet moved into the turbine era) that serves as your resupply base. You will also have a collection of LZs already under your control, as will the opposition. LZs colored gray on the map are open to the first player to get some troops landed on them. 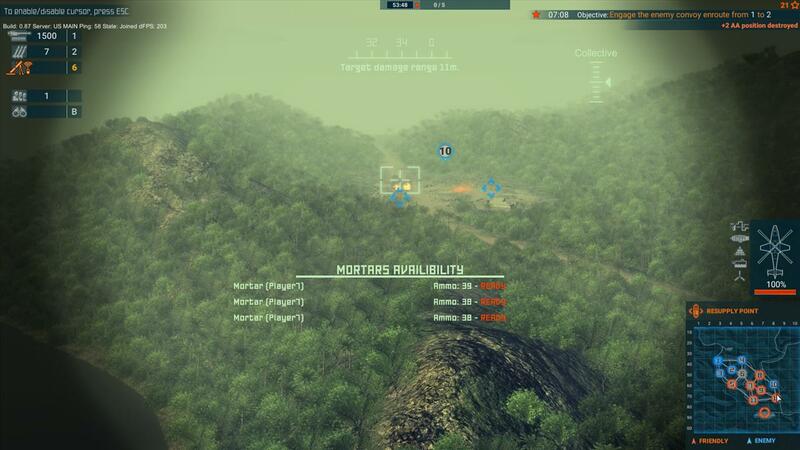 To take an opponents base, you pretty much have to bomb it to oblivion using either your own aerial bullets, rockets, or missiles, or by providing aiming points for you mortar teams. Once the defenses are eradicated, you have to put some troops in place to hold it. The above scenario can also be played in co-op mode where you and other online players fight against AI opponents. Battles can be joined in the lobby, or a player can create their own. Online players can jump into whatever session they want, unless it’s password protected. This password protection is something of a side door into my favorite way to play, which is to set up a two-player co-op game, but put password protection in place. This allows me to play with just me against the AI, but the AI has no air power. 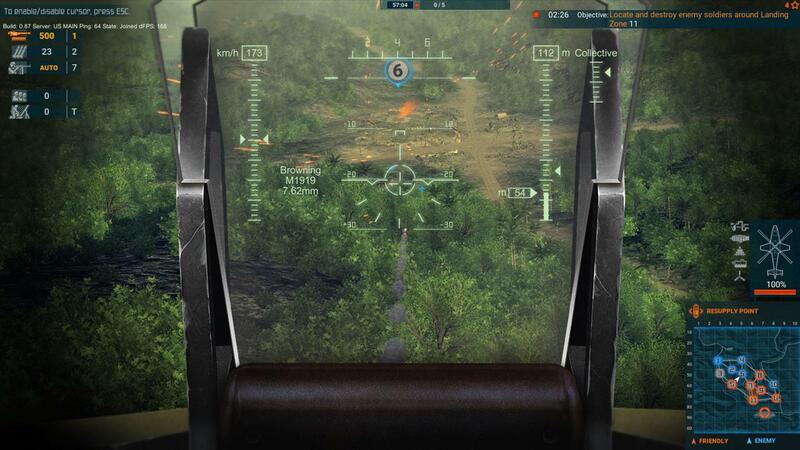 This is an attractive mode because 1) it let’s me concentrate solely on defeating ground troops, which is no mean feat, 2) it keeps someone from jumping into the game and using/destroying helicopters in my squadron, and 3) let’s me score points to use in climbing the tech tree. While it has yet to be released, the dev team is promising that a future update will include an offline single-player mode that makes this type of play easier to configure and provides the additional benefit of providing a bit more structure to the single-player game. So, I mentioned squadrons: this is another major break from the traditional World of Whatevs model. Rather than fight with one airplane, tank, ship, or whatever, you create a squadron of three helicopters. 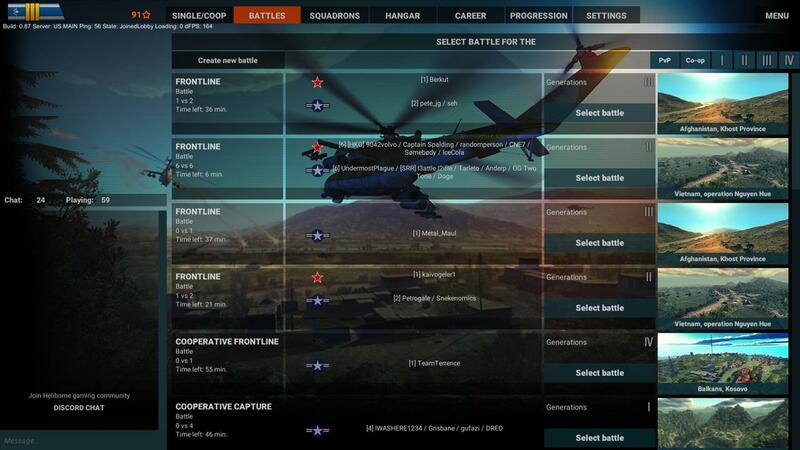 There are three major categories of helicopters to choose from: scout, transport, and gunship. A well-rounded squadron will likely have one of each, although there is nothing stopping you from variations in that theme. Scouts are used for anything that requires close scrutiny of ground forces; the scout can see enemy infantry troops, while the other two types will only learn of their existence when the bullets start to fly. Transports primarily carry troops for a living, but they also carry some pretty hefty weaponry. They aren’t especially nimble, though, so attacks against well defended targets are better done with the armored, more agile gunships. You can only fly one at a time, and after crashing one you either have to wait for it to be repaired or choose a different one from your squadron. This usually works out pretty well, as shown in the opening narrative. Having used the transport to place the mortar teams, my next choice of chopper would be the scout as it is the only one that can make use of the mortar teams. There is also an offline single-player mode. This is currently where the historical campaigns are located. The selection is rather sparse, but the dev team has stated that next update will include a great deal more of this type of content. That’s a good thing for the impatient (I count myself as a member of their ranks) in that it gives immediate access to the historically contemporaneous helicopters. Note that is also gives immediate access to far more powerful antiaircraft weapons, so you will want to be sure to get educated on the proper use of countermeasures before jumping into the more modern battlefields. The other downside to the campaign missions is that they are timed. An example mission is “find and destroy enemy troops.” You are given 3 minutes. It takes almost a minute to get there, so you want to make sure you only need to go there once. The best recipe I’ve found for that is to select a helicopter equipped with a grenade launcher. Horseshoes, hand grenades and all that. The designers also seem to commonly place the activity areas right up against the edge of the map, causing self-immolation to be the most common form of defeat. These are just tuning issues, though, and it’s likely that they will be fixed; the developers are extremely communicative and responsive in the Steam discussion pages. Finally, for the shyest and least confident/competent amongst us, there are training flights. These occur in a large, flat area just south of the hangar base. There are vehicles to exercise weapons against, but no one to fight back. The training area is an exceptional place to practice with the newer weaponry as you gain access to it. Directing the mortar teams in particular is an operation that requires quite a bit of practice to get right. I anticipate spending quite a few practice hours figuring out the guided missiles once I decide to proceed into more modern areas of conflict. I’m looking at you, Afghanistan. Practice flights are also a good way to get comfortable with the flying of these machines. It’s a 3rd person view looking down from above and behind the chopper, which takes some getting used to, but the normally extraordinarily challenging flight behaviors of the helicopters is toned done to a more reasonable level. Certain aspects of helicopter physics, such as translational lift, are lightly modeled, but exist to a degree that makes them discernable without being overbearing. More hideously difficult things like vortex ring state (which manifests itself as a plunge straight down into the ground) are not present at all. So while Heliborne doesn’t model every negative aspect of helicopter flight physics, there are enough of the normal hallmarks of rotary wing flying to make it feel as if you are actually controlling a helicopter, albeit with enough hands-off stability to hold a hover while you’re distracted with aiming mortar fire. Also of note is the alternative 1st-person view. It’s not really suitable for general flight, but it is very good for strafing/missile runs. 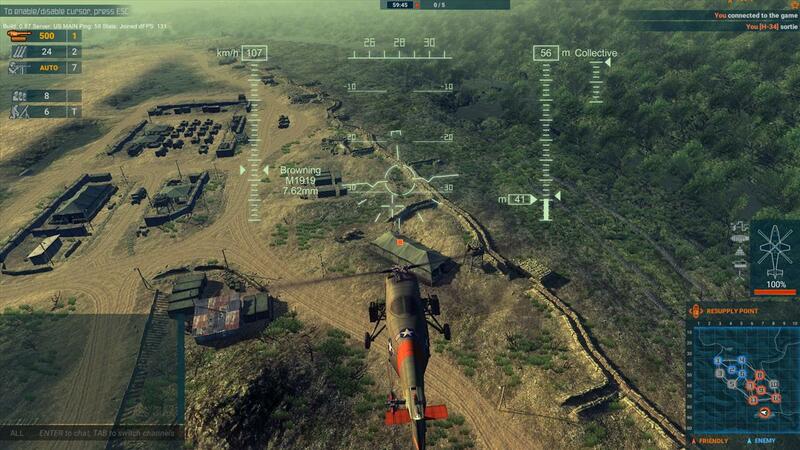 If you are at all interested in helicopters as fighting machines, Heliborne is a very good choice. With the multiple ways of playing, the very approachable flight model that allows you to concentrate more on killing enemies that frying yourself in yet another loss-of-control wreck (I’m looking at you, DCS), and the spectacular visuals, there is bound to be some aspect of this game that gives you exactly what you need. It’s not especially expensive, and having paid for it up front you aren’t going to be pestered by a lethargically slow tech progression intended to frustrate you into paying for additional content. I’m not much of a helicopter pilot and even less of a steely-eyed killer of the skies, but I have still moved further up the tech tree than I am willing to climb at my present skill level. 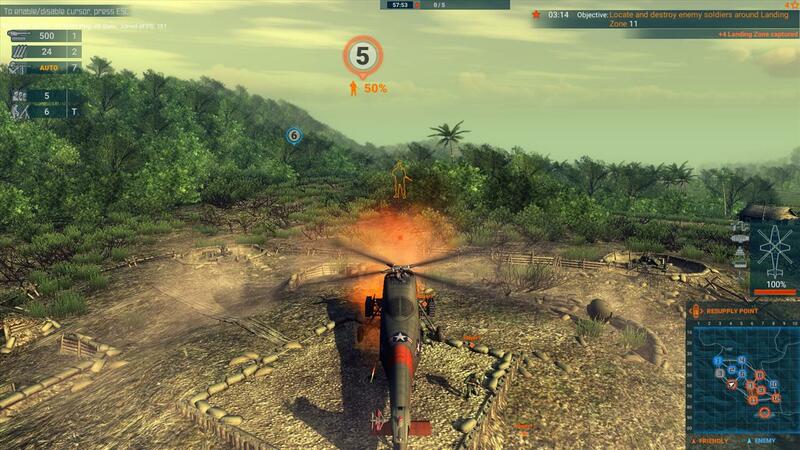 As I said before, Heliborne is not World of Helicopters. 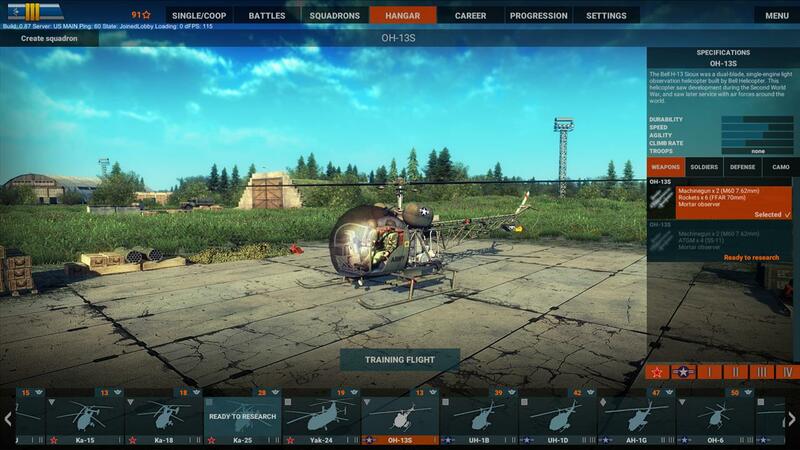 While it's still in early days, Heliborne is already well polished and provides a fantastic mix of tactical airborne helicopter and strategic decision making in a very affordable package. This one is well worth giving a try!